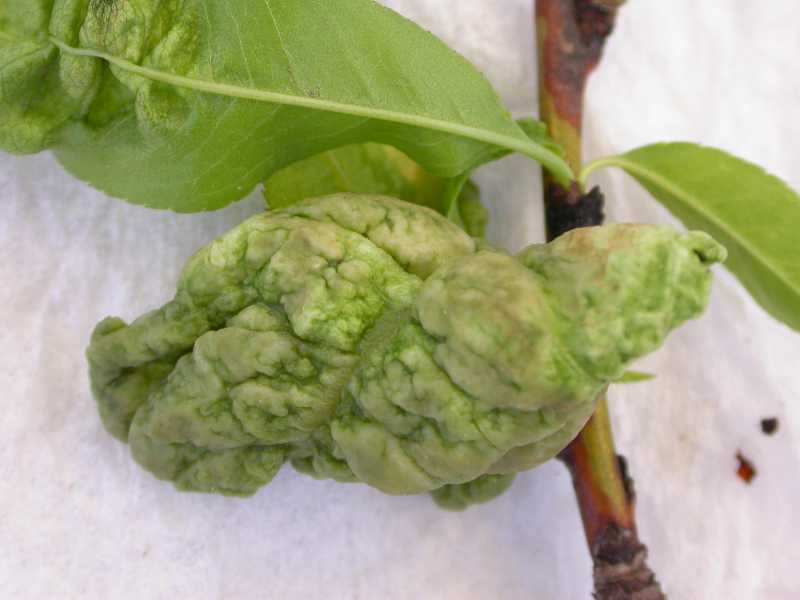 Peach leaf curl is a springtime disease caused by the fungus, Taphrina deformans. It infects the leaves and shoots of peaches and nectarines. Apricots are immune. It is one of the most common diseases of these fruits. It causes the leaves to curl and turn reddish in color. A severe infection can cause reduced yields. Symptoms first appear in spring. New leaves become curled and develop reddish areas. 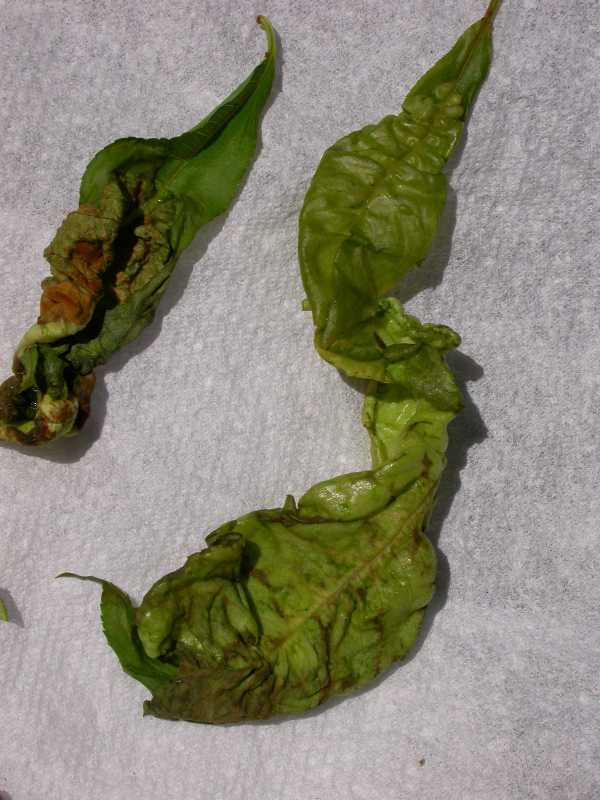 The reddish areas become thickened and puckered resulting in severely distorted leaves. As the disease progresses, the thickened areas turn yellowish gray and become covered with velvety spores. Affected leaves turn yellow or brown and fall prematurely. 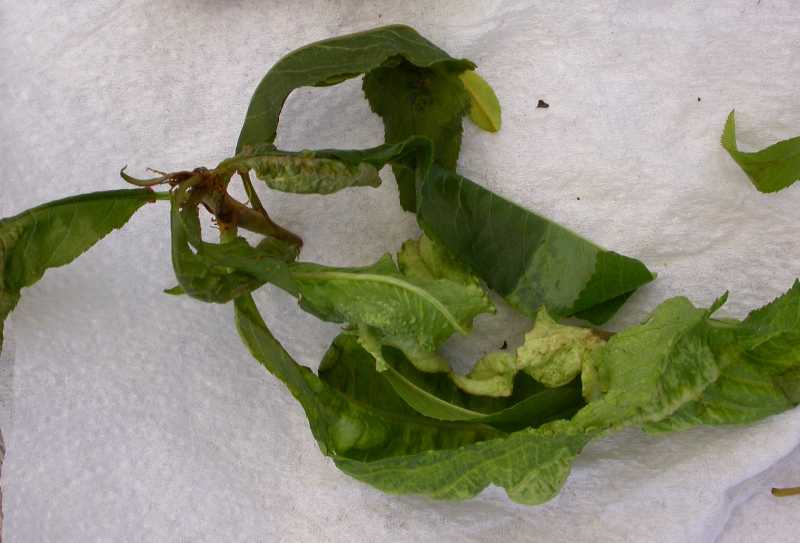 Affected shoots usually send out new leaves which often are unaffected by the disease unless rainy weather ensues. In more severe infections, shoots may become thickened and die. Aphids can also cause leaves to curl. If present, the insects or cast skins will be evident to the naked eye. 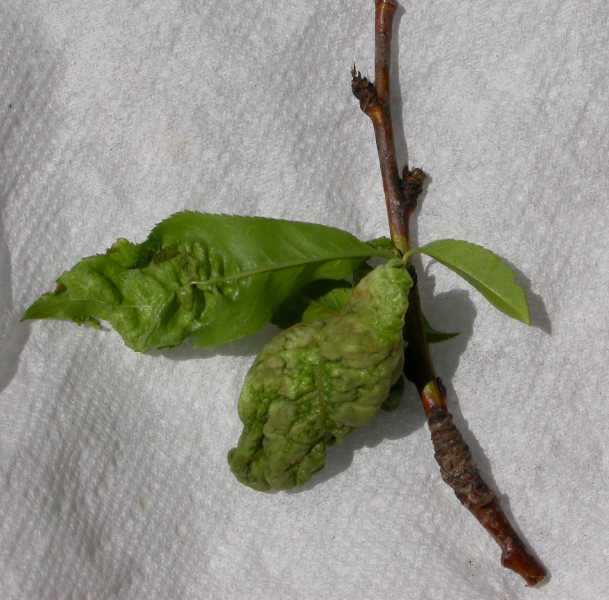 The fungus overwinters on bud scales, on twigs, and on fallen infected leaves. In spring the fungal spores are splashed onto newly developing leaves. During cool, wet weather the spores germinate on the young leaves and initiate infection. Development of the disease slows as temperatures increase. Older leaves are resistant to infection. Consequently, the disease is most prevalent in the spring. 1. Keep plant healthy — avoid excess fertilization. A healthy plant can better withstand the loss of leaves, but excess fertilization can cause succulent tissue that is very susceptible to infection. 2. Clean up diseased leaves. Raking up and disposing of diseased leaves can't hurt, but its value in controlling the disease is slight. 3. Don't panic.Once infection has occurred fungicidal sprays are not effective. A healthy plant should refoliate. Because refoliation normally occurs during warmer, dryer weather, re-infection is usually not a problem. Thinning the fruit crop in years of severe infection can also help maintain plant vigor. To limit damage the year after a moderate to severe infection, follow the protective spray program below. 4. Use properly timed protective fungicidal sprays. If leaf curl was a problem in the spring, apply a protective fungicidal spray after leaf fall in October or November or before bud break in late winter, January through February. After buds have begun to swell fungicidal sprays are not satisfactory. Do not apply to foliage. 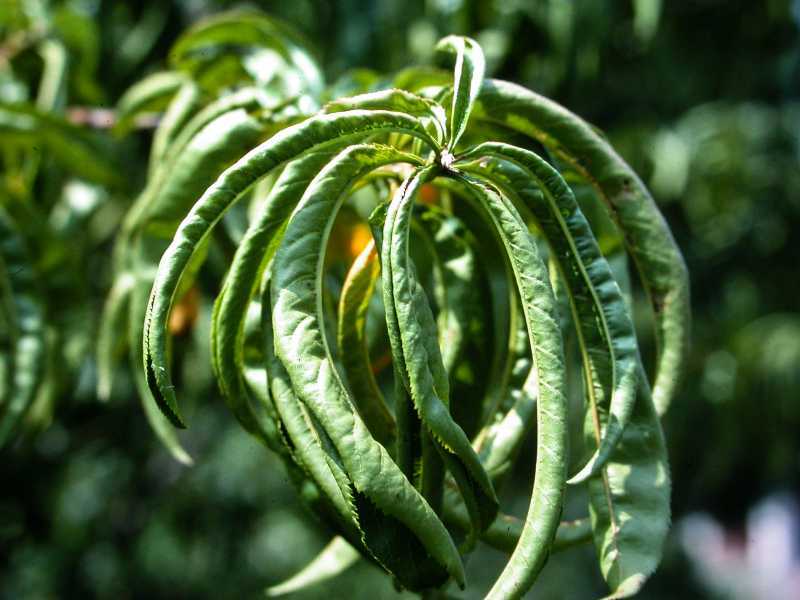 Chemicals effective in controlling leaf curl include copper-based fungicides like Bordeaux mixture, Bravo, lime-sulfur spray, or other brands that list the control of peach leaf curl on their label. 5. Replace the tree with a more disease tolerant variety. If you want to avoid using fungicidal sprays, consider replacing the tree with a more tolerant variety. 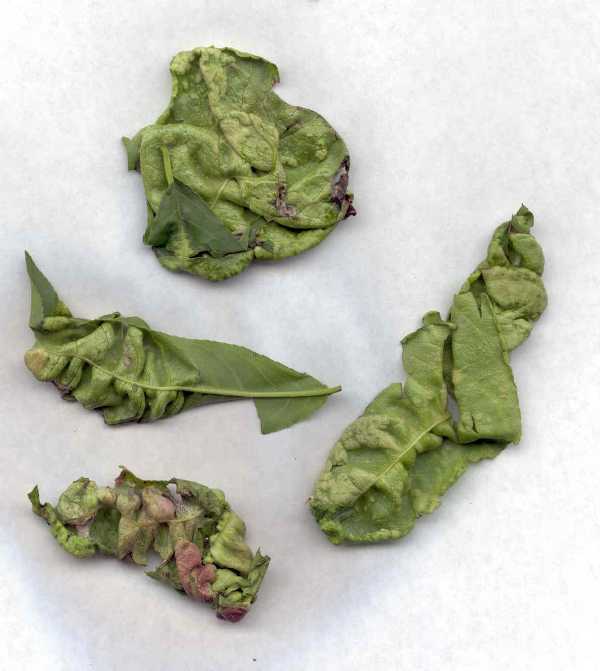 ‘Redhaven’ and cultivars derived from ‘Redhaven’ have greater tolerance to peach leaf curl disease. Strategies 1, 2, 3 and 5 are strictly organic approaches. Of the fungicides listed in Strategy 4, consult the Organic Materials Review Institute (OMRI™) for appropriate organic copper products.